Back in Dubai’s sun and sand after taking in a rather perfect amount of snow in just about the quaintest Alpine setting of Wengen, Switzerland/Jungfrau region of the Alps. Much snowboarding delight was had in the shadow of the Eiger! The best part? 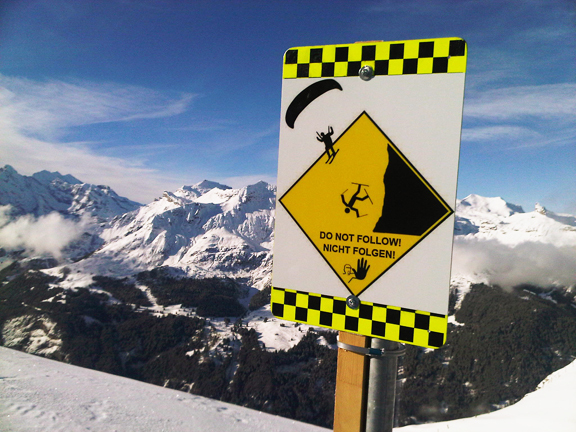 I didn’t follow a para-skier off the side of the Männlichen! Also good? Minimal snowboarding injuries – just a few (OK a lot more than a few, actually) bruises and I’m not exactly sure what I did to both of my thumbs, but they are in serious pain. No texting for me at the moment. But nothing’s broken or fractured, so great success. I haven’t got as many photos to go through as usual from this trip, as most of my time was spent snowboarding. Hopefully I’ll have a proper blog up about my trip later this week. Currently doing a bit of relaxing at home before heading back to work tomorrow. Just taking a snappy break from working out some wall designs. Our walls are shamefully bare (super hard walls that you can’t nail into, frustrating), so today I bought a couple shades of green paint and I am going to paint some stylized bamboo in the living area. I may live in the desert, but at least within the walls of my flat I can pretend I’m in the tropics! Anyway, I hope this project turns out well. I’ve been excited about starting it since before I left for Switzerland.